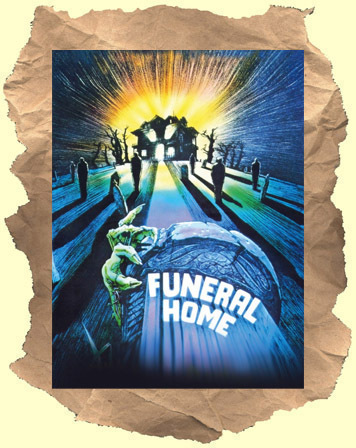 SYNOPSIS: Genuinely creepy 80's horror set in an old funeral home. A young girl travels to stay with her kindly grandmother. She lives at a giant gothic house that used to be a funeral home but has been converted to a bed and breakfast. Not long after she arrives weird things begin to happen. The old "strange noises in the night" kind. Some of the B&B guests don't make it home alive. One oversexed couple in a car gets pushed to a watery grave in the old quarry. The best is when the girl starts investigating the basement of the old house. Great set design with cobwebs, creaky old boards, funeral house equipment and maybe even a corpse or two. This one reminded me a little of another horror favorite: Silent Scream. Like that film it favors atmosphere and suspense over any explicit blood and guts. Although the demise of the dimwitted handy man is pretty gruesome. Recommended. Avoid the poor quality budget dvd release.